Click here for audio of Episode 1766. Today, our guest, Bill Monroe, from the UH Honors College, tells us about doctors and detectives. The University of Houston presents this series about the machines that make our civilization run, and the people whose ingenuity created them. 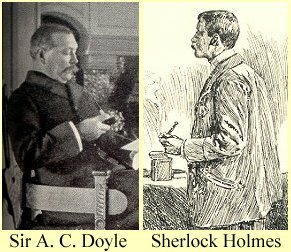 Many of you know that Arthur Conan Doyle, creator of Sherlock Holmes, was a medical doctor; but how many know that the model for the world's most famous detective was Doyle's mentor at the University of Edinburgh, Dr. Joseph Bell? Conan Doyle was seventeen when he met Dr. Bell, and the 39-year old professor made an indelible impression. Doyle soon became Bell's assistant in his ward, where the young medical student played Watson to Bell's Sherlock Holmes. There the magisterial teacher demonstrated dazzling powers of observation. 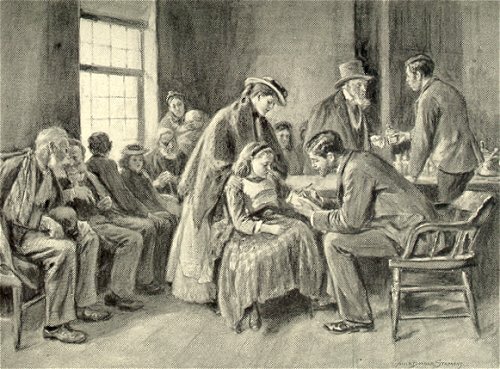 As Doyle would later describe him, Dr. Bell "would sit in his receiving room" and with an impassive face would "diagnose the people as they came in, before they even opened their mouths. He would tell them details of their past life; and hardly would he ever make a mistake." Thus the great detective's propensity for close observation and his famous capacity for deduction derive from the medical practice of one Scottish physician. But the method of Joe Bell was a harbinger of the power and popularity of modern science. By the turn of the century, the Sherlock Holmes tales had become best sellers, the first real popular blockbusters. And through Doyle's art, a fictional detective's uncanny knack for clarifying the mysterious and simplifying the complex was becoming known and admired throughout the world. Since he first appeared in 1887, the reputation of the world's greatest detective has only become more pervasive. According to the New York Times, Sherlock Holmes is the most portrayed character in movie history. Over 75 different actors have brought his aloof certainty to the screen. Our collective fascination with Holmes is understandable: Wouldn't it be nice if villains could all be identified, and the causes of our diseases, individual and social, could be determined with absolute certainty? A man of varied interests, including the supernatural, Doyle himself grew tired of his most famous creation. Holmes's solutions began to seem reductive as well as deductive. By the 1890s Dr. Doyle wanted to move on and tried to kill off the rational monster he had created. But soon enough, the author was forced by popular demand to bring the virtuoso detective back to life. Yet he did so so grudgingly that one of Doyle's biographers dubbed him "The Man Who Hated Sherlock Holmes." Society, on the other hand, has remained enthralled by the power of explanations that put forth a single definite cause for things that go wrong. If Doyle grew bored with Holmes's dazzling solutions, perhaps it was because, as a physician, he knew that illness was rarely so simple, and as a novelist, he knew that life never was. I'm Bill Monroe, at the University of Houston, where we're interested in the way inventive minds work. William Monroe is professor of English and Associate Dean of the Honors College at the University of Houston. His book Power to Hurt: The Virtues of Alienation was selected as an outstanding academic book of the year by Choice magazine for 1999. Other publications include the play Primary Care, which deals with end-of-life issues related to Alzheimer's Disease, and articles on the relationship between reading and the practice of medicine and on the images of physicians in literature. He is currently at work on a book to be called American Job: Flannery O'Connor, Alien Prophet. Booth, Martin, The Doctor and the Detective: A Biography of Sir Arthur Conan Doyle. New York: St. Martin's Press, 2000. Doyle, Sir Arthur Conan, Memories and Adventures. Boston: Little, Brown, 1924. Doyle, Sir Arthur Conan, Sherlock Holmes: The Four Novels and the Fifty-Six Short Stories Complete, 2nd ed. New York: Crown Publishers, 1975. Meyer, Karl, E., The Curious Case of the Immortal Sleuth. The New York Times (19 Jan. 2000), pp. B1 and B8. Wood, James Playsted, The Man Who Hated Sherlock Holmes: A Life of Sir Arthur Conan Doyle. New York: Pantheon, 1965. Artist's image of Dr. Arthur Conan Doyle in his student clinic. Almost as famous (and cinematic) as Sherlock Holmes was Doyle's book, Lost World. 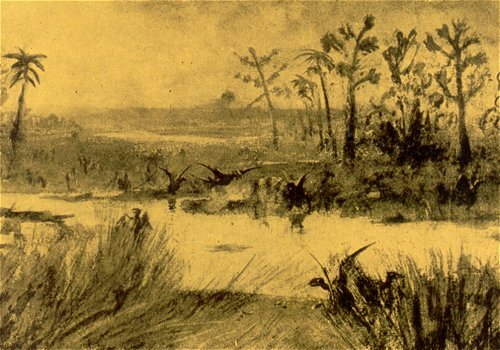 This image, titled The Swamp of the Pterodactyls, is from a 1912 edition of that book.